My life insurance application has been postponed? What does that mean? Or you may receive a postponement. Now we all know what it means to be approved for life insurance, so there’s really no need to go over that, but what about when one’s life insurance application gets postponed or denied? Find life insurance coverage elsewhere. And/or prepare yourself better the next time you apply for life insurance. For those who are looking for additional information regarding a denied life insurance application be sure to visit our article: Top 10 Reasons for Being Declined Life Insurance. My life insurance application was postponed, now what? Well the good news is that your life insurance application wasn’t flat out denied, which means that the company that you applied with still thinks you may be a future candidate for insurance. They just aren’t ready to approve you yet! Some outstanding medical procedure that’s planned in the future. I.e: a future surgery or a routine diagnostic procedure. A doctors recommendation in your medical file that has yet to be completed. Some unusual results on your life insurance medical exam. Poor driving history or recent DUI. A current or recent bankruptcy. A positive drug test during your life insurance medical exam. Now let’s first examine the non-medical “life style” causes for a life insurance application postponement. Life insurance applications that are postponed due to a “life style” choice are usually the easiest to deal with because after all, it’s a life style choice, not a true medical issue. the life insurance agent had access to a wide spectrum of insurance companies to choose from. 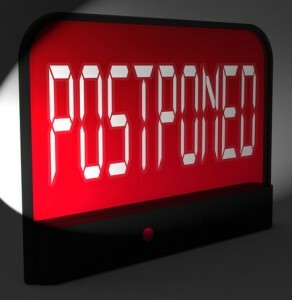 Understandably one of the most peculiar reasons to have a life insurance application postponed, bankruptcies are quickly becoming one of the most common reasons for a life insurance application to be… postponed! The short answer is, money. For a full breakdown on the financial reasons why some life insurance companies choose not to offer life insurance for those with a recent bankruptcy on their record, please visit: Can I Get Life Insurance After Filing Bankruptcy? The good news here is, that there are few life insurance carriers out there that will provide coverage to those that have a recent or current bankruptcy on their credit history. So for those of you who have been postponed due to bankruptcy, fear not, there still may be a chance to get insured right away. With nearly 6 million American’s with a DUI on their driving record, it’s easy to see why DUI’s can commonly cause one’s life insurance application to be postponed. For this reason, it’s key to know which life insurance companies are going to be the most lenient when it comes to underwriting those with a DUI on their driving record. This is why we here at TermLife2Go have spent considerable time researching this issue and are happy to say that we’re now able to find full term and whole life insurance coverage for those with a DUI on their record, even if it’s within the past 12 months! So now let’s take a look at some of the Medical reasons for a life insurance postponement. Given the scope of the issue, it’s going to be impossible to cover every medical issue that could cause a postponement on your life insurance application, so we’ll try keep it general so that you can get a feel for how the “system” works. With that being said, let’s go back to the three examples we used before and briefly address each of them individually. An outstanding medical procedure that’s planned in the future. This is a tough one because it makes sense for a life insurance company to want to wait until you have had any and all future procedures completed prior to offering you life insurance coverage, especially when we are talking about future diagnostic procedures. Now with that being said, there are a number of different surgical and non-surgical procedures out there that may cause one insurance company to want to wait and postpone your life insurance application, while another equally qualified life insurance company may be completely fine with. So when it comes to an outstanding medical procedure, it never hurts to call us and ask about it, there’s a very good chance that you could still be insured without waiting! Unfortunately sometimes these recommendations can have a negative effect on your life insurance application. And who can blame the doctor? With the amount of liability that a doctor faces today just by seeing his or her patients, it’s no wonder that when given the choice any sane medical practitioner can, and usually will, error on the side of caution. Which means, that you as the patient, and life insurance applicant, may have all sorts of recommendations, made by your doctor, in your medical file, that you have no idea about! Re-apply for life insurance with a more lenient life insurance carrier? Obtain a note from the doctor who made the initial recommendation explaining the reasoning behind the recommendation to appease the life insurance underwriter? Or go ahead and pursue the doctor’s initial recommendation? Again, without knowing the specifics, it’s impossible to know what would be the best course of action, however it only takes a minute to give us a call and we’ll be happy to help! Some unusual results on your life insurance exam. Now with this one, it’s important to note that if you haven’t seen a doctor in 20 years, it may be a good idea to go and have a physical done so that you can compare the results that were collected by the life insurance company with that of your primary care physician. Because who knows, maybe these “unusual” results could be a sign that you need to start taking better care of yourself. With that said however, life insurance mobile medics are not doctors! Properly store and process examine specimens. Record ones height and weight. And in some cases perform an EKG. Their day consists of traveling from one appointment to the next seeing anywhere from 1 to 5 clients in a day. You should fast anywhere from 8 to 10 hours prior to your exam. You should avoid any caffeine or tobacco immediately before your exam. And in general your blood pressure and cholesterol levels will be lowest first thing in the morning. So assuming that you decide to take your exam first thing in the morning, what happens to your lab results from there? In short, they will be placed in a small plastic cooler and kept in the backseat or trunk of your examiners car until their day is done. Now this could be for 20 minutes or it could be for 8 hours. Which is why we here at TermLife2Go are always very skeptical when it comes to an “unusual” lab finding when our clients appear to be completely healthy otherwise. For this reason, if you truly feel that the insurance company has made a mistake, give us a call and tell us about it, we can always schedule a new medical exam, free of charge and see if we get the same results as before! And next time, be informed on how to ace the life insurance medical exam. Now you may be asking yourself, if TermLife2Go can do this, why can’t my current agent do this as well? He or she may be able to do this for you. However it’s also possible that he or she may be what is call a “captive” agent and is only able to represent one insurance company. companies such as: State Farm, American General, Met Life or Farmers. In which case, when your application gets postponed your options become very limited. It also may be the case that your life insurance agent is working in one of the many larger “call center” insurance brokerages whereby they are competing against their fellow agents for “new leads”. In cases like these, your agent may just not have the time needed to devote themselves to your case. But whatever the situation is, you owe it to yourself to give us a call and see what we can do for you. If we can help, we’ll let you know right away, if we can’t you’ve lost nothing! We are not a life insurance company. We are an agency comprised of seasoned life insurance professionals. Our job is to find you the best life insurance company at the best price —for you! Give us a call today to see just what we can do for you. It could save you thousands of dollars over the life of you policy. If you enjoyed our article, Postponed Life Insurance, or have additional questions, please leave a comment below. Previous Post: Can I get life insurance after filing bankruptcy?